Popular Indian news portal - indiablooms.com Hacked By PakBugs ! Popular Indian news portal www.indiablooms.com, the online version of the national news agency India Blooms News Service (IBNS), was hacked by the Pakistani hackers on Sunday afternoon. "Pakistani Hackers- Your site has been Hacked" said the redirected page of the site which was hacked around Indian time 330 pm. Later the site administrators restored the original index page, but the threat of another attempt looms large. 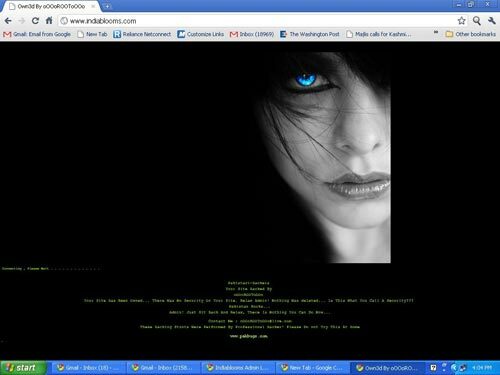 The visitors of India Blooms were directed to the page of a menacing looking woman with a blue eye with some sentences at the bottom in green claiming the site has been hacked. "There was no security on your site, relax admin, nothing was deleted, is this what you call a security?" read the site, hosted by Servage, a hosting company based in Germany. Servage currently hosts 189837 websites. "Of later we face a regular attack from hackers, especially after the popularity of the site soared," said S Dhar, one of the partners of India Blooms. "The site has a good viewership in Pakistan," he said. On Dec 3 , the website of India's federal investigating agency- Central Bureau of Investigation (CBI)- was hacked from Pakistan. Visitors to the site- www.cbi.gov.in- were redirected to a page that said the site was hacked by a self-proclaimed "Pakistani Cyber Army" to avenge the hacking of Pakistani websites by "Indian Cyber Army". The hackers posted the message "Pakistan Zindabad" (Long Live Pakistan) on the site.